After contracting polio as a baby it was deemed, thankfully, that swimming would be good therapy for me. So I learnt to swim and by the time I was eighteen months old I was splashing freely in pools, rivers and in the sea. It was and is a wonderful thing to feel fully mobile and free of gravity. It feels good to be able to let go of my cumbersome caliper and move swiftly and easily through the water. 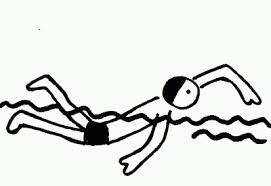 Ever since childhood I have swum regularly and now at the ripe old age of 58 I swim three times a week. I taught all four of my daughters to swim and I realise now that through swimming we have all learned a great deal about life from the art of keeping afloat in the water. As I make my way through the water I remain very focused on simply moving my limbs and breathing. The trick is to keep swimming. What a helpful metaphor for handling life’s challenges! Lao Tzu the Daoist sage suggests that to “achieve greatness in little things….do great things while they are still small” (63rd verse of the Dao De Ching). If you concentrate on the end result by focusing on the future or worrying about past performance you will feel overwhelmed. Instead Lao Tzu tells us to stay in the present moment, small stages of your project–in this way you can effortlessly handle whatever comes up. Too often we obsess with the “bigger picture” analysing past performance and agitating about future outcomes. Instead we need to take life a stroke at a time –we need to just keep swimming, keep breathing, staying effortlessly afloat! I have recognised that if, before I get in the water, I visualise the lengths I am about to swim I can feel discouraged –there suddenly seems to be an awful lot of work infront of me. If on the other hand I just start to swim freely, in the moment, letting go of the discouraging chatterbox mind and instead feel the water enfolding me then I soon find I am in the flow –at one with swimming. By becoming aware of nothing else save the movement my limbs make in the water and of my breathing there is no swimmer and water –just swimming. When faced with life’s challenges the trick really is to keep, metaphorically, swimming. At the time of writing this we are all facing the so called “credit crunch” and a time of contraction in the economy. Many people are worrying about losing their jobs and having their homes repossessed. We may not be able to control the economy as a whole but we do have control over our attitude towards the situation we find ourselves in. We can choose not to drain our energy by focusing on the worries of our inner chatterbox – that voice of doom and gloom – but instead choose to focus on the present moment. In this way energy can be protected so that we are strong to meet whatever challenges come our way. If whilst reading this you are feeling unwell, frustrated, sad, worried, fearful and generally discouraged remember to stop trying to hang onto how things were or how you feel things should be. Dropping the past and letting go of future expectations puts you slap bang into this one moment –the only time there is. As Lao Tzu said “do great things while they are still small.” To resolve challenging times in your life start with the little things that are available to you in the present; breathe, relax your shoulders, affirm “ Right here, right now all is well”. Floating, like swimming, is a great way of learning to let go of the chatterbox mind that is always thinking and planning. Whilst floating you are simply being in the water –breathing and letting yourself go with the flow. Try floating next time you are in a pool allowing yourself to totally surrender, let go and trust the water to buoy you up. Feel the serenity that comes from accepting and disregarding the incessant chatter of your mind whilst relaxing into your own watery space. Release everything that causes you stress and simply be in the water. This article was previously published in Positive Health magazine.